Tottenham have had a £12million bid accepted by Burnley for striker Danny Ings. The 22-year-old is considering his options as he has offers from Liverpool and Real Sociedad. He is known to favour a move to Anfield but Tottenham have now forced the issue knowing that Liverpool are reluctant to bid that high. The Reds want two strikers but have a limited budget and Aston Villa's Christian Benteke is their other main target. However, Spurs' bid will drive up the tribunal hearing valuation, which could make it difficult for Liverpool as the anticipated £4-5m fee could go up to £8m or £10m. 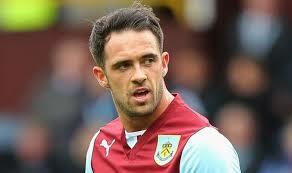 If Ings opts to join Sociedad the fee would be even less at around £250,000. Burnley would obviously favour Tottenham's bid but know Ings holds control of where he ends up. Ings told the Lancashire Telegraph on Wednesday: 'My holiday's the first thing on my mind. I'm looking forward to a bit of downtime and after that it's going to be hard work again. 'It's going to be a short summer for me this year but I love football so I'd play it every day if I could. 'After that I'll sit down with my agent and discuss my future then. Burnley would be grateful for the cash windfall as they need two strikers next season. They were dealt a crushing blow on Wednesday with news that Ashley Barnes is facing up to a year out after damaging his anterior cruciate and medial collateral ligament. Burnley, who are poised to appoint former Brentford director of football Frank McParland next week, are also expecting to lose Kieran Trippier to Tottenham in a £3.5m deal.